MING DYNASTY PAIR OF HUANGHUALI WOOD ROSE CHAIRS CARVED IN BAMBOO MOTIF. Overall Height 35 in. (89 cm.) - Dimensions of Seat, Height 19.75 in. (50 cm. ), Width 22.5 in. (57 cm. ), Depth 18 in. (46 cm. ), Circa 1600-1675. Bamboo, a symbol of integrity, loyalty and durability of character in the scholar-gentleman, has been a source of inspiration for both Chinese poets and painters since ancient times. Also, the attraction of bamboo as a construction material and design motif did not escape the attention of even pre-Song furniture craftsmen, who favored its use in developing one of the earliest styles of Chinese furniture design. 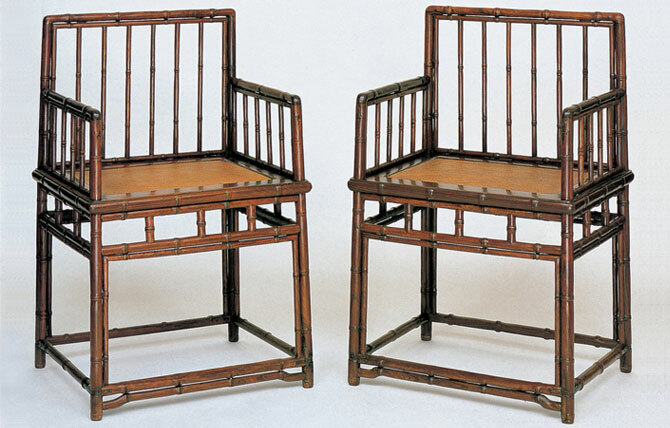 This elegant pair of rose or low-back chairs is carved entirely from huanghuali to simulate bamboo, and the craftsman painstakingly has shown his virtuosity by smoothing and rounding the huanghuali members to just the right thickness, achieving the desired effect of delicacy of proportion and refinement of style. Originally in the holdings of Ming Furniture Ltd., the pair is now in The Minneapolis Institute of Arts. A similar set of huanghuali horseshoe armchairs simulating bamboo can be seen in the Nelson-Atkins Museum of Art, Kansas City.